With the recent warm weather and hopefully it is here for awhile, our supporters events move into June. 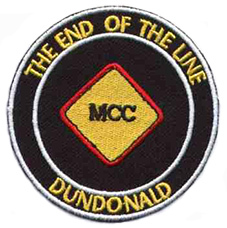 June kicks off with this weekends The End Of The Line MCC Off The Rails Rally on Saturday, then the Quay Vipers MCC involvement in the Titanic Motorcycle Challenge – Guinness World Record Attempt and finally N.I. Bikers & Trikers Riding For Charity S.O.S Bus Fundraiser Rideout, right at the end of the month. The BikeSafe NI assessments are FREE in 2012 and are conducted by an Advanced Police motorcyclist, with years of experience behind them. The most different makes of motorcycles in a parade. Current record is 138 at an event organised by the Killspills Campaign (UK) at Donington Park Race Circuit, Leicestershire, uk, on 26 may 2007. 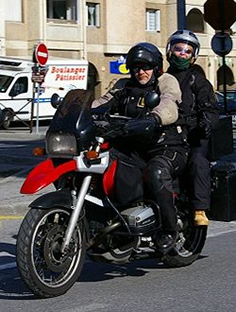 The 22 June 2012 falls within “Motorcycle Safety Week”‘. During this week the Institute of Advanced Motorists (IAM) – the UK’s largest road safety charity have ten motorcyclists traveling throughout Britain and Ireland to highlight motorcycle road safety. 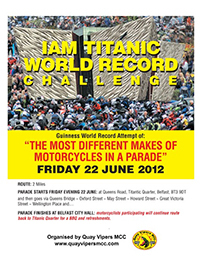 When they’re in Northern Ireland this Guinness World Record attempt is their way of drawing attention to their road safety plight to encourage motorcycltsts to complete the IAM’s advanced Riding Test (www.iam.org.uk) and BikeSafe’s FREE rider assessment by the PSNI (www.bikesafe.co.uk). They’re also raising money for charities who save road accident victims. 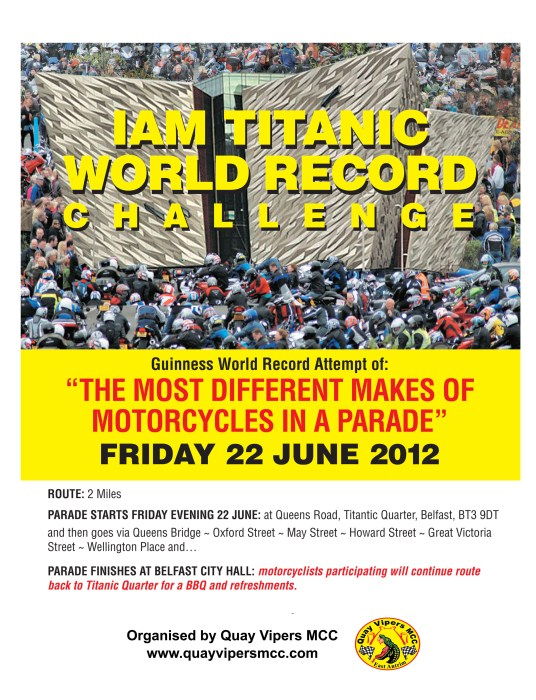 Why Belfast for the world record attempt? Northern Ireland is known for the Titanic, Giants Causeway, Golfers and Motorcycling, all but motorcycling is being celebrated this year. A fact that may be of interest this year is that the first person to circumnavigate the world was Karl Stearns a New Yorker who started from Dublin and came through Belfast on the first leg of this historic trip. Motorcycle adventurists Geoff Hill will be emulating this event in the coming year. The proposed route will be for 2 miles starting on the Queens Road, Titantic Quarter and finishing at Belfast City Hall, via Queens Bridge, Oxford Street, May Street, Howard Street, Great Victoria Street and Wellington Place. Every year, Chopper Club Ireland put on their Custom and Classic bike show. It has been going from strength to strength over the years and has become one of the best in Ireland. O’Riada’s Bar is a fantastic new venue alongside the main N21 road, between Castleisland and Tralee, Co Kerry. It provides a beautiful location for the Bike Show, while the entertainment will take place in the beer garden and adjoining marquees. As always, the Club are looking at ways of improving things and 2012 will see again further refinements especially in terms of entertainment. The show will feature more bands than ever before as well as other entertainment including the Stiletto Girls! For full details and information, how to get to the show, accommodation, trophy categories, bands, show times etc.